Passengers going to the airport (Departure): All pre-booked passenger’s traveling to the airport will receive a call from an agent from our office 1 to 2 days prior to your flight. The agent will confirm your time the assigned driver will pick you up, address and luggage. You will be given the drivers name and cell number. The assigned driver will call you the night before to re-confirm all details. If you have not heard from your driver by 19:00 (7:00 pm) please call the driver or call the office and leave a message. Pick up times for travel are subject to change due to time of day >rush hour, construction, road closures, weather and road conditions. Passenger’s flights arriving to the airport (Arrival): We do not call to confirm passenger’s arriving to the airport. It is the passenger’s responsibility to confirm if you wish too, you may email or call the office the day before you arrive for your pick up time and drivers name. All pre-booked passenger’s arriving to the airport must check in at the Ground Transportation Counter located inside each terminal. All our passengers are pre-registered at the counters and the agents are waiting for you to check in. By not checking in within a reasonable time from your flight arrival, the driver could be released to go, leaving you to take the next available service. Delayed or missed flight arrivals are subject to a transfer fee of $25.00 per person for the next available same day shared service. If combined with a private, premium rate applies. The next day service is an additional shared ride service. The agents at the Ground Transportation Counter do receive notifications of flight delays and cancellations, but it is the responsibility of the passenger to inform .us if you missed a flight, flight cancellation or delay as we do not know if you have taken another flight. If your scheduled flight is cancelled......and released to go. No refund will be given. If your flight is delayed your wait time will vary. You may have to take the next available service…which could be the next day. If your transportation has been booked “Private” – the driver will wait however, every additional hour, after the first hour of your scheduled arrival time, is $25.00 per hour. Once you have your luggage and have exited out into the public concourse. Turn right and follow the signs for Ground Level or Ground Transportation/Out of Town Van Services ... not Taxis and Limos. The Ground Transportation Counter is located on the Ground Level between pillars ‘R’ and ‘S’ inside the terminal. If you use the escalator, the check in counter is located at the bottom of it. The Out of Town Ground Transportation Counter is located on the Arrivals Level between EXIT DOORS ‘C’ and ‘D’ inside the terminal. If you are arriving on International flights or flights from the United States, turn left when you exit baggage claim, past Exit Door ‘D’, the check in counter is on your right. 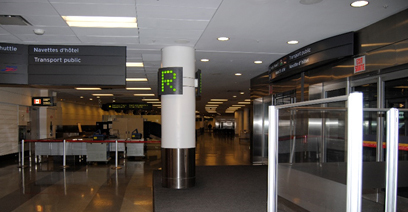 If you are arriving on flights within Canada, turn right when you exit baggage claim, just past Exit Door ‘C’ the check in counter is on your left.